Sorry but the show is on hiatus. I may bring it back sometime. The phone line still works if you want to leave a message that I may still use. My is a podcast about everything related to Marilyn Monroe. Includes Marilyn in the news, collectibles, her music, music inspired by her, interviews, discussions about events in her life, etc. More than 45 years after her death we are still fascinated by this child-like woman whose image is more popular today than when she was alive. My name is Melinda Mason and I have been a fan/collector for over 18 years and I will try to answer any questions that you have. I have been doing the podcast since April 2005! Below you will find the most recent episodes which are available to download. If you are interested in listening to older shows please visit "The Archives" section. Just call the voicemail line below and I may use your message on the show. Feel free to comment about what you've heard on the show - do you agree? disagree? Ask a question, review an exhibit or book, etc. As an alternative to using the voicemail line (long distance charges do apply) I can also accept an audio clip in either .wav or .mp3 format. Simply record it on your computer and email it to me. For those who can't record just audio send me a video clip and I will use the audio from it. Feedback is always appreciated at or you can write a comment under the corresponding show below. This show focuses on the relationship between Milton Greene and Marilyn includes audio clips of Amy Greene and excerpts from the book, "But that's another story". Here is the Person to Person interview Marilyn did from the home of Milton and Amy Greene. New Marilyn social networking website click on the below banner to become my friend - don't forget to also join the Podcast Group! Winner of Marilyn Monroe sunglasses announced! Marilyn exhibit in Jersey - rare costumes!! Comment from Lorraine - what is your favourite thing about Marilyn? Winner of replica Niagara dress announced! Hey Dollface on Ebay also has Marilyn wigs! Marilyn Blonde Ambition Barbie has been released PURCHASE YOURS HERE!! Comment from Eliza - has anyone seen Norma Jeane & Marilyn? Win your very own replica Niagara dress! Get your answers to marilynfan@gmail.com by Feb 14th! NOTE: The Buddy Map is currently not working. I am trying to find an alternative provider for a similar map. Vintage Articles - can you help to transcribe? Life as a Legend art exhibit at Saginaw Art Museum and Sunny Thompson's Forever Blonde October 25 - if you are going let's meet up for dinner. 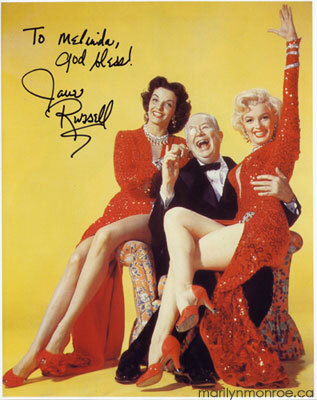 Excerpt from Russell's autobiography "My Path and My Detours"
Jane Russell Song: "Ain't There Anyone Here For Love"
Contest - Win a 72 card base set! Ontario Marilyn get-together - postponed until August 9 - Film screening is confirmed - More updates soon! Interview with Tara Hanks, author of "The Mmm Girl". 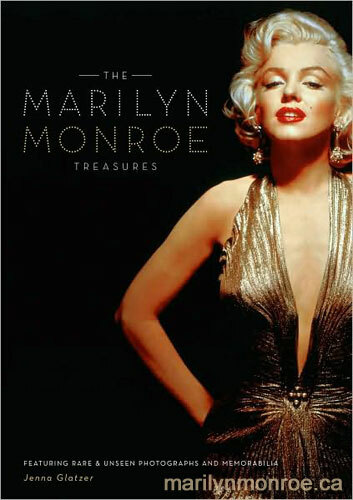 Includes excerpts from his autobiography "You See, I Haven't Forgotten"
Surprise Book Giveaway - if you are on the Buddy Map listen for your name and win a copy of "Marilyn Monroe: Her Life in Pictures"